Once Austin Peek made up his mind to ask Mary Frances Mabbett to the junior prom, he decided he wanted her to remember the proposal as much as the event itself. So, he enlisted an oversized sign board and a cow in a tuxedo to help him pull it off. Austin Peek and Mary Frances Mabbett at Chick-fil-A Griffin, Ga.
Austin, 17, and his friends are regulars at their local Chick-fil-A restaurant in Griffin, GA. 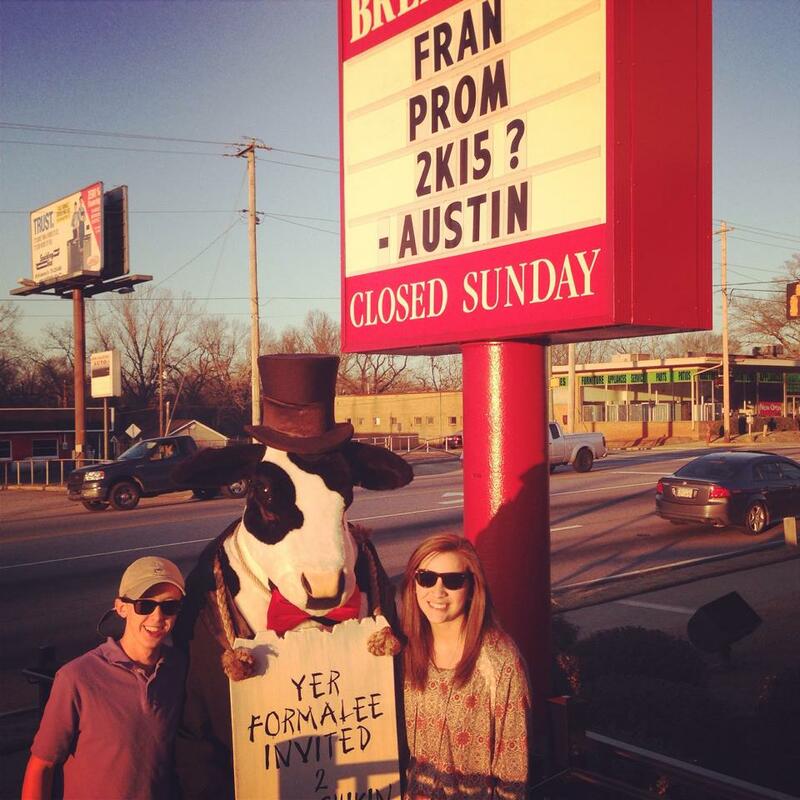 When he called marketing director Katheryne Fields to ask about using the restaurant’s marquee for his prom proposal, she agreed and suggested one more thing: bring out the gussied-up Chick-fil-A cow mascot to add to the fun. When Mary Frances approached the entrance with her friends around 6 p.m., Austin was waiting with the cow under the marquee. But instead of the usual campaign for seasonal menu items or events, the sign board read “Fran Prom 2K15? – Austin.” Katheryne had also arranged for the mothers of both teens to be there to witness the event. Mary Frances said yes and posed for photos with the cow and a grinning Austin. Then everyone went inside and enjoyed dinner together. As teens all over the country prepare for their annual high school proms, the proposals that lead up to the formal dance are getting more elaborate and creative. Teenagers like Austin are enlisting friends and family to help coordinate scavenger hunts, choreograph dance productions and conspicuously spell out “Prom?” with everything from tennis balls to lily pads. A search of “promposals” on YouTube results in thousands of videos depicting teens proposing at basketball games, via flash mobs, with clever signs and, in one case, with a serenade of Disney princess songs and live violins in the school cafeteria. 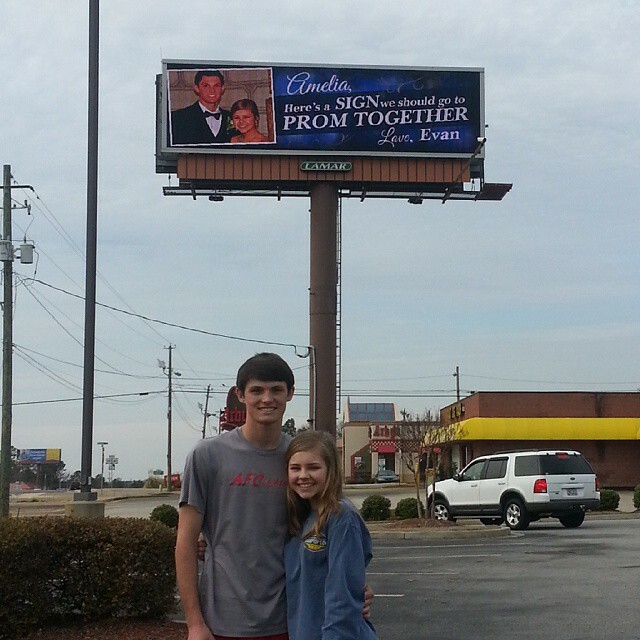 Evan Davis and Amelia Smith in Griffin, Ga.
Evan’s mom Christie, who works for a sign company, helped him with the design, while he took care of arranging for his date to see the giant board. While some of the costs and time involved rival marriage proposals, “promposals” are generally a positive phenomenon, says Barbara Greenberg, a Connecticut-based clinical psychologist specializing in the treatment of children, teens and parents. “Our sometimes moody teens are demonstrating remarkable creativity and positive energy in their attempt to do something that will be fun and exciting,” she points out. In an essay about the trend for the Huffington Post, Barbara also notes that the “promposal” often involves a cohesive group effort. Employees of Chick-fil-A restaurants report that on-site prom proposals are a common event this time of year. In Burleson, Texas, a teen recently came in ahead of his date and arranged to have “I’d be one lucky nugget if you’d go to the prom with me” scrawled on the inside of her box of chicken nuggets. Manager Kristen Bohon said employees watched from a discreet distance as the girl opened the box. “Then he did a thumbs up, and we all gave a cheer,” she said. College freshman Caroline Decker has also witnessed several creative prom proposals during her work as a front-line team leader at the Southern Pines, N.C., Chick-fil-A. Chick-fil-A team member Payton Thompson in Southern Pines, N.C.
Last year, she recalled, her friend and co-worker Payton Thompson was disappointed when she was told she’d be working the drive-thru window on a particularly cold night. 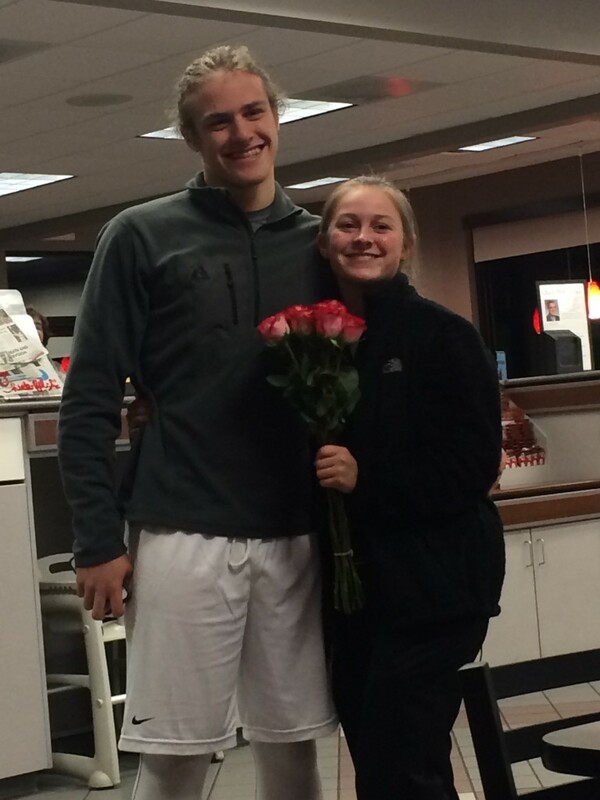 As it turned out, Caroline said, Payton’s aspiring prom date had orchestrated the drive-thru assignment, so he could cruise by the window with roses and a sign painted on the driver’s window reading “Payton Prom?” A video captures her gleeful surprise and the in-the-know colleagues giggling in the background. Caroline, the target of a thoughtful prom proposal herself last year, thinks the trend is a way of keeping things interesting, especially when couples have been together a while and there’s no surprise element in who’s asking whom. Caroline’s senior-prom date, Kyle Corbett, arranged an elaborate scavenger hunt, hiding clues throughout the county, until she arrived at the local country club, where he had spelled out “PROM?” with green tennis balls across a chain-wire fence. 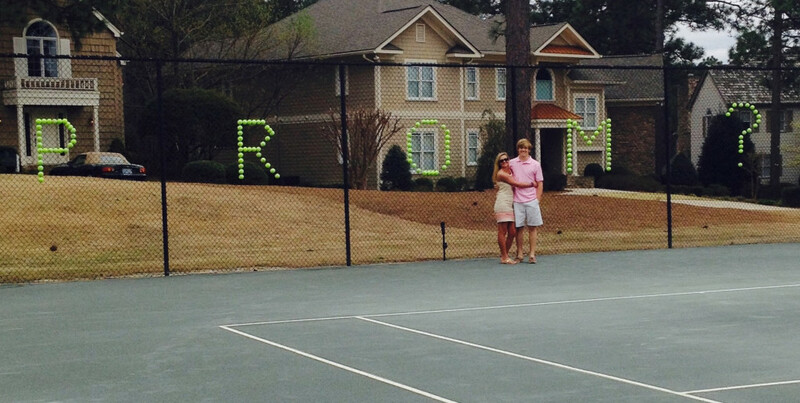 Caroline Decker’s date spelled out “PROM?” with tennis balls in his promposal.